PITTSBURGH– More than a decade ago, Ralph Hollis invented the ballbot, an elegantly simple robot whose tall, thin body glides atop a sphere slightly smaller than a bowling ball. The latest version, called SIMbot, has an equally elegant motor with just one moving part: the ball. The spherical induction motor (SIM) invented by Hollis, a research professor in Carnegie Mellon University's Robotics Institute, and Masaaki Kumagai, a professor of engineering at Tohoku Gakuin University in Tagajo, Japan, eliminates the mechanical drive systems that each used on previous ballbots. Because of this extreme mechanical simplicity, SIMbot requires less routine maintenance and is less likely to suffer mechanical failures. The new motor can move the ball in any direction using only electronic controls. These movements keep SIMbot's body balanced atop the ball. 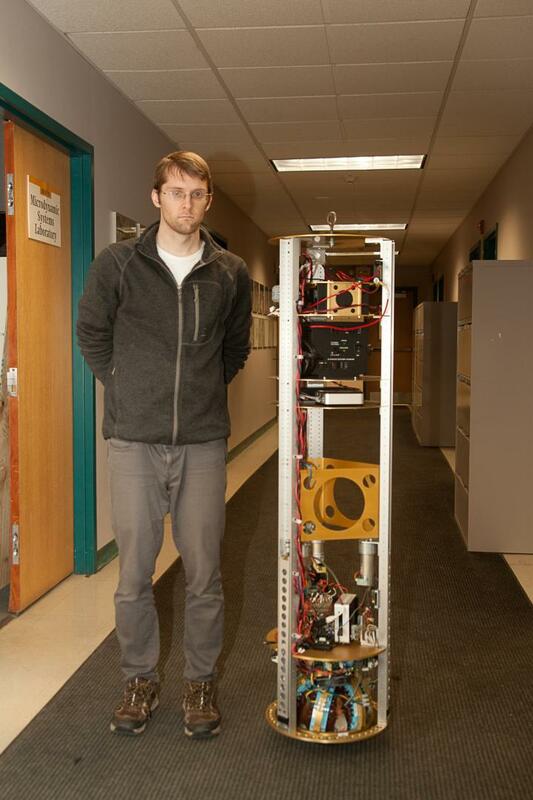 Early comparisons between SIMbot and a mechanically driven ballbot suggest the new robot is capable of similar speed — about 1.9 meters per second, or the equivalent of a very fast walk — but is not yet as efficient, said Greg Seyfarth, a former member of Hollis' lab who recently completed his master's degree in robotics. Induction motors are nothing new; they use magnetic fields to induce electric current in the motor's rotor, rather than through an electrical connection. What is new here is that the rotor is spherical and, thanks to some fancy math and advanced software, can move in any combination of three axes, giving it omnidirectional capability. In contrast to other attempts to build a SIM, the design by Hollis and Kumagai enables the ball to turn all the way around, not just move back and forth a few degrees. Though Hollis said it is too soon to compare the cost of the experimental motor with conventional motors, he said long-range trends favor the technologies at its heart. "This motor relies on a lot of electronics and software," he explained. "Electronics and software are getting cheaper. Mechanical systems are not getting cheaper, or at least not as fast as electronics and software are." SIMbot's mechanical simplicity is a significant advance for ballbots, a type of robot that Hollis maintains is ideally suited for working with people in human environments. Because the robot's body dynamically balances atop the motor's ball, a ballbot can be as tall as a person, but remain thin enough to move through doorways and in between furniture. This type of robot is inherently compliant, so people can simply push it out of the way when necessary. Ballbots also can perform tasks such as helping a person out of a chair, helping to carry parcels and physically guiding a person. Until now, moving the ball to maintain the robot's balance has relied on mechanical means. Hollis' ballbots, for instance, have used an "inverse mouse ball" method, in which four motors actuate rollers that press against the ball so that it can move in any direction across a floor, while a fifth motor controls the yaw motion of the robot itself. "But the belts that drive the rollers wear out and need to be replaced," said Michael Shomin, a Ph.D. student in robotics. "And when the belts are replaced, the system needs to be recalibrated." He said the new motor's solid-state system would eliminate that time-consuming process. "Even without optimizing the motor's performance, SIMbot has demonstrated impressive performance," Hollis said. "We expect SIMbot technology will make ballbots more accessible and more practical for wide adoption." The National Science Foundation and, in Japan, Grants-in-Aid for Scientific Research (KAKENHI) supported this research. A report on the work was presented at the May IEEE International Conference on Robotics and Automation in Stockholm, Sweden.